43000 Kajang, Selangor Darul Ehsan, Malaysia. Head-Offices: 3-24-6 Nakamagome, Ohta-ku, 143-0027, Tokyo, Japan. Factory: 18-1, Yoshima Industrial Zone, Iwaki, Fukushima-Pref. 970-1144, Japan. 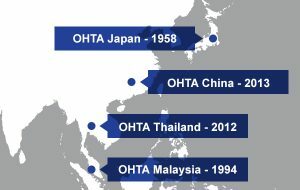 Ohta (Shanghai) International Trading Co., Ltd.
Ohta (HK) International Trading Co., Limited. Dongguan Kiyota Precision Co., Ltd. Being a crucial active component of the production line support to our various business partners in an ever changing and competitive economic environment, we have always believed that success in any business relationship lies in the secret of providing impeccable Quality, utmost Reliability and all-round Consistency. Copyright © 2017 Ohta Precision (M) Sdn Bhd. All Rights Reserved.